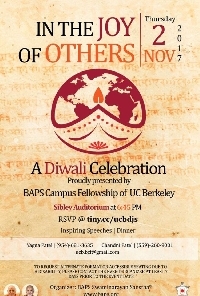 BAPS is hosting a Diwali event on campus at Sibley Auditorium on November 2! There will be appetizers from 6:45-7, and the program will begin at 7:15. The program will include musical performances and inspiring speeches, and will conclude with dinner at 8pm. Please rsvp at tiny.cc/ucbdjs if you are able to make it! Free Indian Dinner and Celebration at Simbley Auditorium. Be sure to wear Indian Clothes if you have them!